The Kindle wasn't quite the first ereader to appear on the scene, but it helped to popularise ebooks like nothing else before or since - it essentially did for digital reading what the iPod did for digital music. Here we chart the history of Amazon's biggest hardware hit, and show you just how far the device has come since 2007. Today, the original Kindle looks like a museum piece; back in 2007, it was a game-changer. Priced at $399, it sold out in five-and-a-half hours, and featured a 6-inch display capable of four shades of grey. It had 250MB of internal storage, a memory card slot, and the revolutionary Whispernet system for delivering books over 3G for free. The first (left) and second (right) Amazon Kindles. The original Kindle - big and bulky though it was by today's standards - was a runaway success, but Amazon took its time with the second generation model (the "2" is unofficial as these devices are always just called "Kindle"). It was slimmer, more stylish, and upped the internal storage to 2MB - roughly enough to hold 1,500 ebooks. The Kindle DX went big, with a 9.7-inch screen designed to take on a certain upcoming touchscreen device from Apple. It could display ebooks in both portrait and landscape modes, kept the QWERTY keyboard like all the Kindles before it, and had a battery life of up to two weeks. It picked up three stars in the T3 review. The DX and DX Graphite followed in quick succession. By 2010, Amazon wasn't messing around. The DX was quickly followed by the DX Graphite, with vastly improved e-ink technology and a darker case, though the other specs (like the 4GB of on-board memory) remained the same. 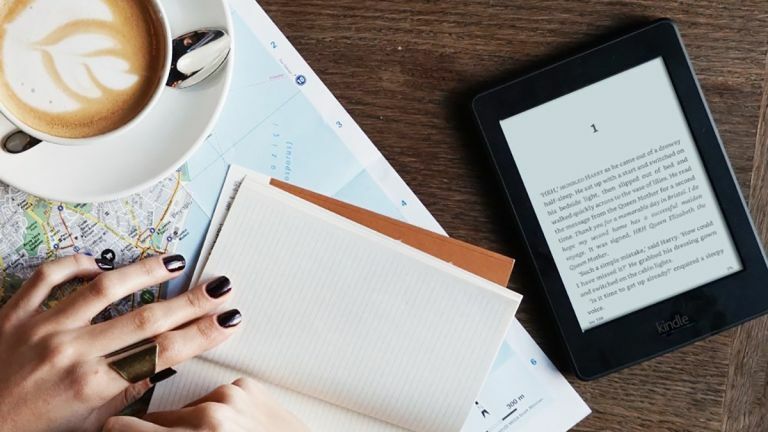 Despite its large size, it set a new design trend for Amazon's ereader that can still be seen today. Every Kindle up until now had had a physical keyboard, but this one was retroactively named the Kindle Keyboard after it was succeeded by a touchscreen version. It's also unofficially known as the Kindle 3. With a 6-inch display and 4GB of storage, it was the first Kindle to include Wi-Fi, and became the fastest-selling Kindle thus far. The third-generation Kindle was the last with a QWERTY keyboard. 2011's Kindle (again the "4" was unofficial) ditched the physical keyboard for an on-screen version, but it was still controlled via a direction pad underneath. The screen size was the same, the e-ink technology was the same, but Amazon managed to shave off some of the thickness and weight as the Kindle approached the modern era. Now we're getting somewhere: the first touchscreen Kindle appeared in the same year as the Kindle 4, and the year after the iPad arrived. Besides the infrared touch sensors, there's not much that's different between this device and the Kindle 4, though it was the first model to feature X-Ray for looking up details of characters and themes. The first touchscreen Kindle appears. The Kindle 5 introduced the familiar black bezel (which took over from dark grey): it was lighter and cheaper, made text easier to read, and loaded pages faster, but the writing was on the wall for the non-touch models. With users now more reliant on the cloud, the internal storage was down to 2GB, but the low price made this an appealing deal. 2012 was the year the Kindle Paperwhite arrived on the scene, a higher-resolution and fully touchscreen Kindle with integrated LED lights that meant you could use the ereader in the dark (without a lamp) for the first time. It gave Kindle buyers a choice of a premium option alongside the budget ereader offering we mentioned above. The first Kindle Paperwhite, as reviewed by T3. The second-generation of the Paperwhite showed up just 11 months later, with better e-ink contrast, improved illumination and a faster processor (so faster page turns). Internal storage got bumped back up to 4GB and even though the tweaks over the previous edition were relatively minor, it earned some impressively high review scores. The most recent budget Kindle is known as the seventh generation (with the Paperwhite referred to as the sixth). Physical buttons finally got ditched completely last year, and if you can live without the integrated LED lights and a lower resolution screen, this Kindle remains excellent value for money as far as ereaders go. The line up today: Kindle (left), Kindle Paperwhite (centre) and Kindle Voyage (right). Usually referred to as "the best Kindle ever", the Voyage offers an even higher resolution for the screen, and display illumination technology that automatically adjusts itself based on the ambient lighting conditions. It has haptic feedback for page turns too, and is the lightest and smallest ereader Amazon has ever released. The most recent Kindle to appear is the third-generation Paperwhite, which sits between the budget model and the Voyage. All three have a 6-inch screen and 4GB of storage, but the mid-range Paperwhite is perhaps the best value of the lot - it also has the best battery life of all three current models, lasting up to eight weeks on a single charge.